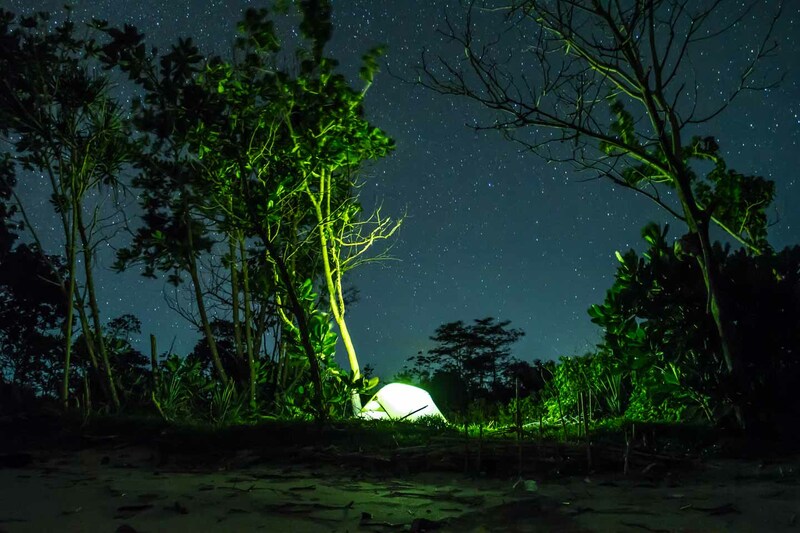 No matter if you are planning a trip around the world or just a short vacation, you might be haunted by the same question: Is it worth taking a tent or should I leave it at home? There's no general answer to this question but the following article will give you some real life insights on the pros and cons and a quick buyers guide in case you are toying with the idea of making the investment. For the real adventurer and natural purist there is nothing like being out alone in the wild. 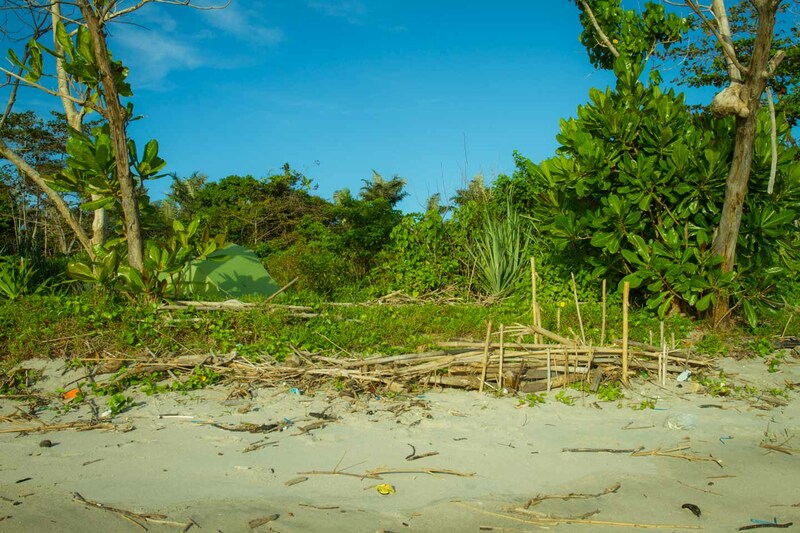 A tent is a great way to take a minimum of comfort into the jungle and give you shelter for the night. In fact, modern tents are high-tech products with various features that will not only keep you warm and dry but make your trip into the wilderness a pretty pleasant experience. The idea of pitching up your temporary home wherever you roam is quite compelling and big outdoor companies have made an art of selling dreams and illusions. In reality, many tents spend an unpleasant life tucked away in some closet or attic. Once you get beyond the high gloss magazines, showing tents pitched up in breathtaking landscapes, you might realize that taking a tent has a few downsides. The most important and obvious is that carrying your mobile home will take up a far bit of space and add weight to your backpack. On a long or steep track a few extra pounds can really make the difference. Planning a hike along a route of shelters will cost you some extra money and make you less flexible, but eliminate the hassle of carrying the extra weight and pitching up the tent. After two years of traveling I have to say that we did not use our tent anywhere close to what we thought we would. Like with many people my mind was full of great pictures and romantic illusions of how and where I would pitch my 300 Euro investment. Most of the time we ended up sleeping in our car or in cheap accommodations. Nevertheless we had several great nights out in the bush that made up for some unforgettable memories I don't want to miss today. If you are torn whether or not to take a tent on your travels, a major step is being honest with yourself. Ask yourself, how often will I really use the tent and am I really willing to sacrifice the space and weight to keep up to the highest level of flexibility. If you already have a tent, think back on how many occasions you have really used it? If you haven't used your tent in the past, chances are pretty good you will not use it in the future. Being honest with yourself is hard but in return will give you the best answer you can get. Before I give you my final verdict, let's have a look at some of the key features of modern tents. I will not go to much into technical details but rather point out a few things that might be useful for your decision, especially if your are planning to buy a tent. If you intend to camp wild, which in my eyes is one of the main argument for carrying a tent, make sure your temporary home is somewhat camouflaged. The picture above was taken in Singapore's East Coast Park. As a matter of fact camping is allowed in special areas but you have to posses a permit. A permit can only be obtained by Singapore's citizens and is checked on a daily basis. To cut a long story short, I decided to rather camp wild in a non camping area, than run the risk of being caught without a permit on the campground. 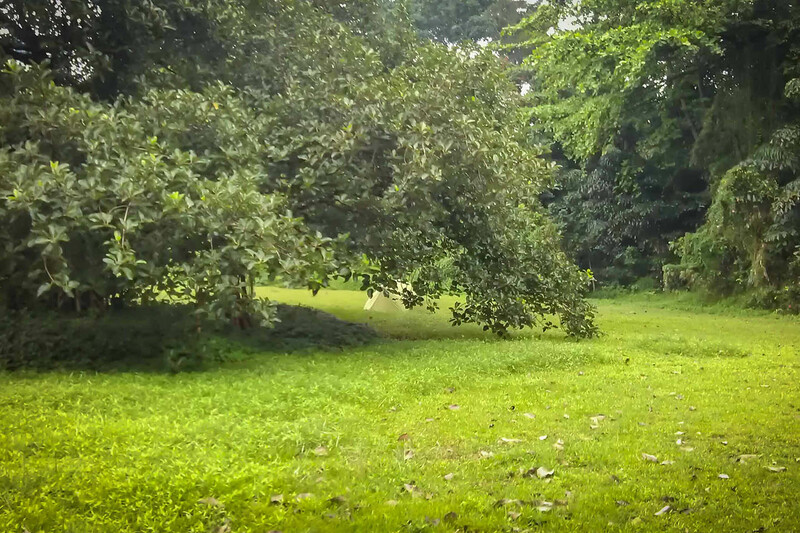 Like you can see on the picture the color of my tent perfectly merges with the surrounding vegetation. During the night two police controls passed by without even noticing me. It's quite obvious that traveling tents need to be extreme lightweight and durable, but don't forget to have a look at the construction itself. Basically there are two different layouts, those that can stand alone and those that need guy lines and other external support. Definitely go for the one that can stand alone! They used to be a lot heavier but in times of modern high tech materials there are some exceptions. Stand alone tents are overall less hassle and do not rely on good ground conditions. If you want you can pitch them up on any ground, even a solid timber floor. Make sure to buy a double wall tent. Those tents consist of a durable and weatherproof exterior shell and a light weight, breathable shield on the inside. Having two layers has a lot of benefits and gives you the flexibility to adapt to different temperatures and situations. 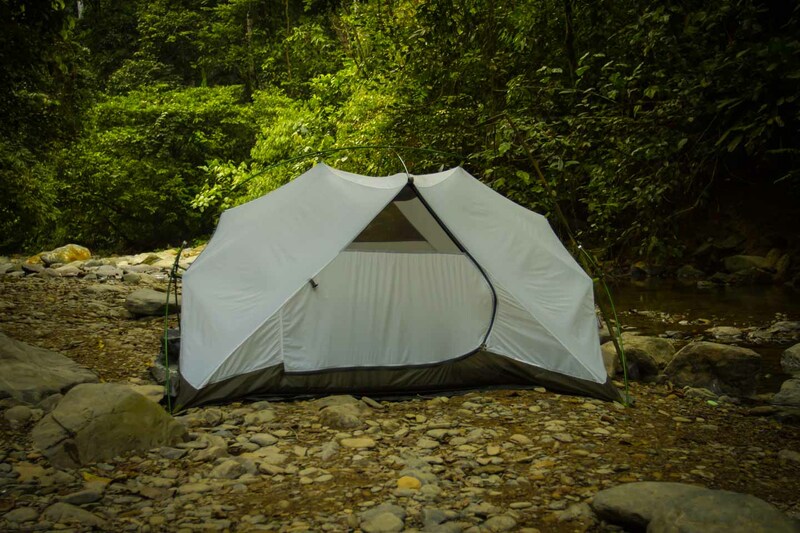 In hot and dry areas you can use the tent without the second layer to get a maximum airflow and protection from mosquitos and co. In case it get's colder or rainy you can mount the second wall within no time to give you the extra protection. As an additional accessory to my tent you can buy a second tarpaulin with the same tent's floor layout. This so called footprint allows you to use both walls of the tent independently to each other. You can pitch up your tent in heavy rain without anything getting wet on the inside. Just start setting up the waterproof outside layer first, move everything inside and work from here, safe and sheltered from the elements. 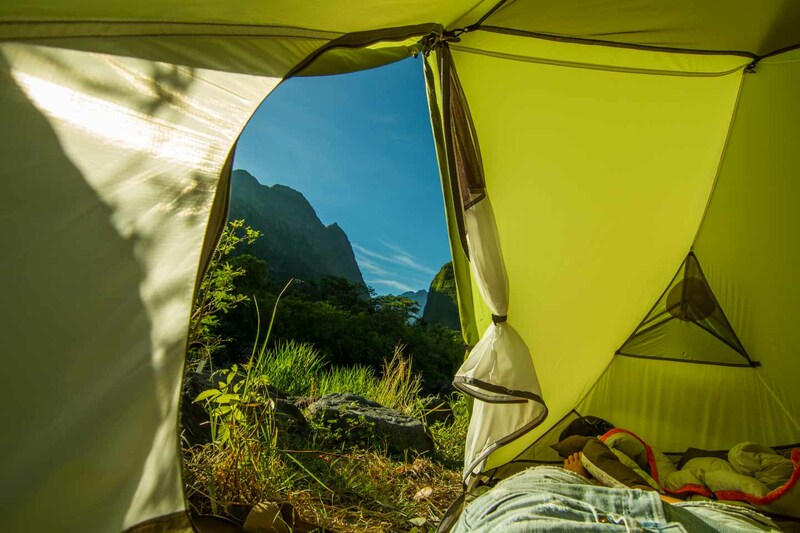 Once you got yourself a tent, try to get familiar with it before starting your travels. 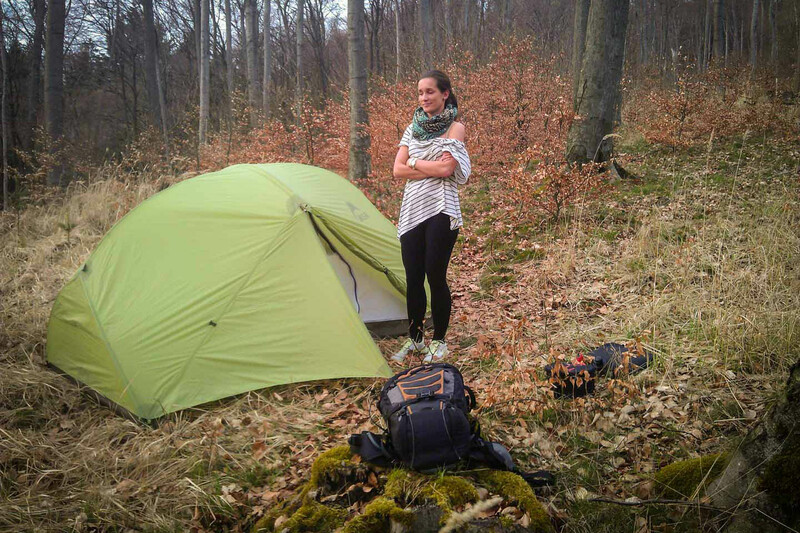 Like you can see in the photo above, Anita is not really impressed by camping in the forest close to our hometown. But being out under real conditions, spending your first night in the tent, is the only way to get to know your gear, find out it's weak points and a way to fix them before you are in the middle of nowhere. I actually did not think about buying the additional footprint until we walked into some heavy rain. It turned out to be quite essential and there would have been no way to buy one in Asia, our first destination and just the beginning of our long, long trip. Tents give you a great deal of flexibility but it's up to you to make use of it. During our travels we got stranded on several airports and I rather turn some heads by pitching up my tent than spending a night on an uncomfortable bench. We usually went surprisingly fine and most people thought it was a great idea. On Changi Airport in Singapore I ran into a police control and instead of giving me a hard time the police officer complimented me on my great tent. He even knew the model and brand, must have been an outdoor fan himself. 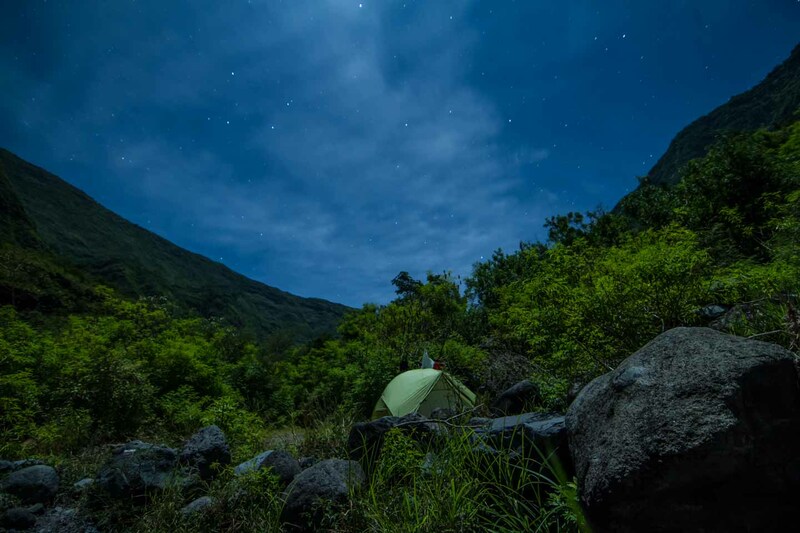 In La Réunion Island we camped tucked away behind some movable walls. Unfortunately we did not know that the airport is closed during night time and the watchmen was pretty surprised when he found us at 3 o'clock in the morning. 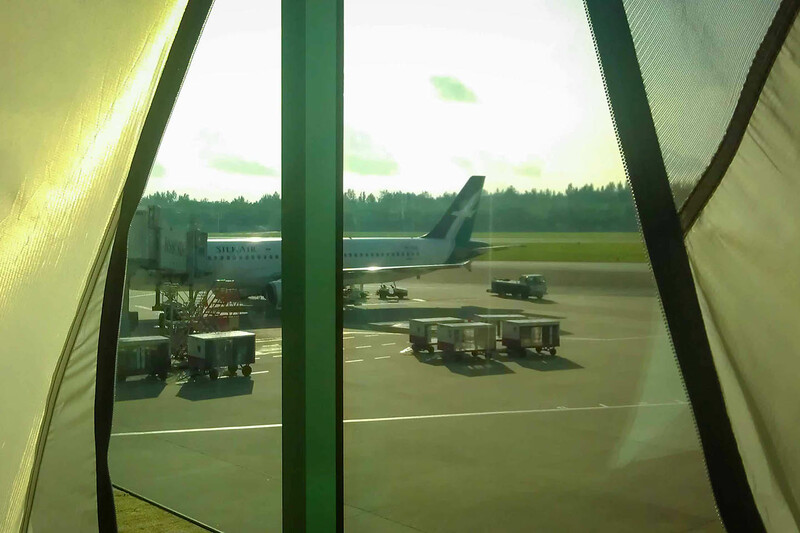 We got kicked out and had to camp in front of the airport. Bad luck at that point but a funny thing to remember now. 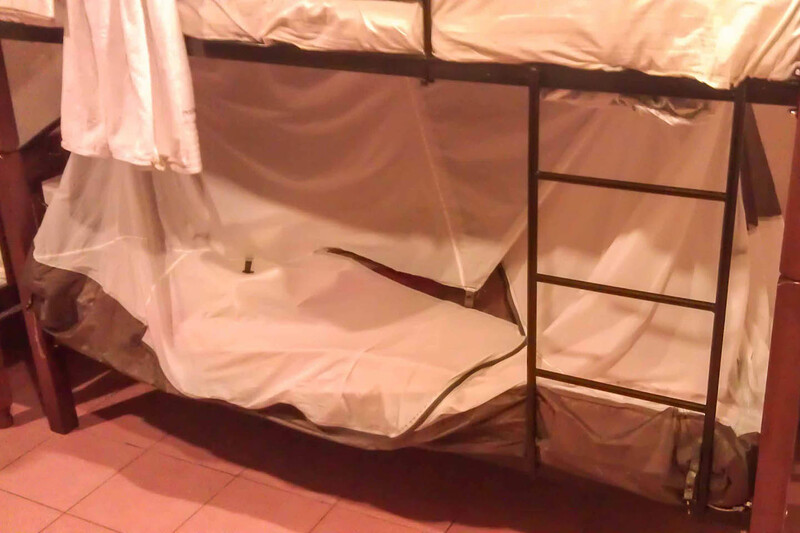 In a cheap and filthy hostel in Borneo I used the inside layer of my tent to protect me from bed bugs. I wrapped it around the mattress and thought I was save from any encounters. Stupid me, the bugs were hiding in the mattress and I ended up not only getting several bites but having bed bugs in my tent. I arranged to stay an extra two nights for free and kept my tent in the freezer, the only way to get rid of those little monsters. On another occasion in Sumatra we actually pitched up the tent on our bed inside our accommodation. We are not prissy when it comes down to dirt and impurity, but the mattress was contaminated to such an extend and covered with all sorts of biting insects that we rather set up the tent than being exposed to this surrounding. 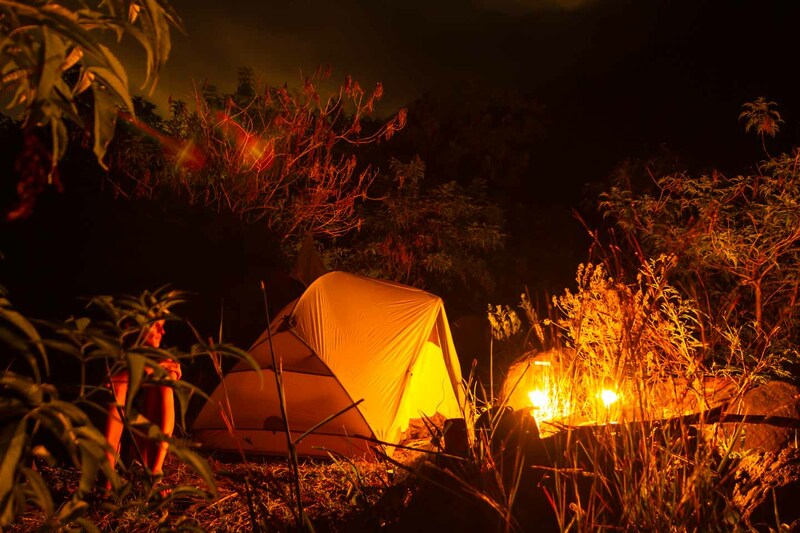 Beside all the creative use we really had a few perfect occasions to spent some nights out in the wild. 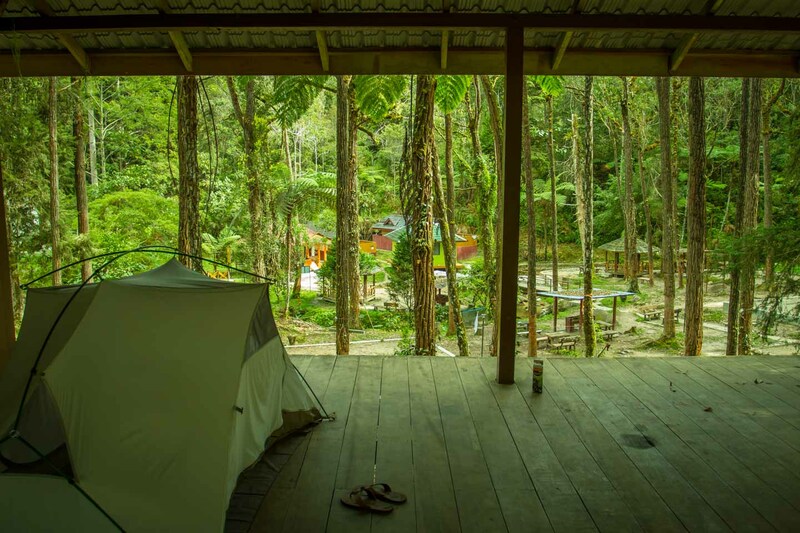 We camped a week at Nusa Kambangan in Java, used the tent on several hikes like the one in the Mossy Forest in Malaysia and spent a lot of single nights when we did not know where to stay. We camped on grass, sand, mud, solid rock and even frozen ground. We slept in temperatures from below zero to +40 degrees, from burning sun to heavy rain. Like I said before, we did not use the tent as much as we intended, but whenever we pitched it up, we really enjoyed the time and made some great memories. Last but not least, here's my verdict. If you ask me if I would advice to take a tent, it's a tie. I think it all comes down to the two factors on how much you actually want to camp and which country your are going to visit. If you are going to Asia, leave it at home. Usually the weather is quite hot, nice camping spots are rare and accommodations are dirt cheap. If you are generally more adventurous and planning to visit remote areas, take it along. 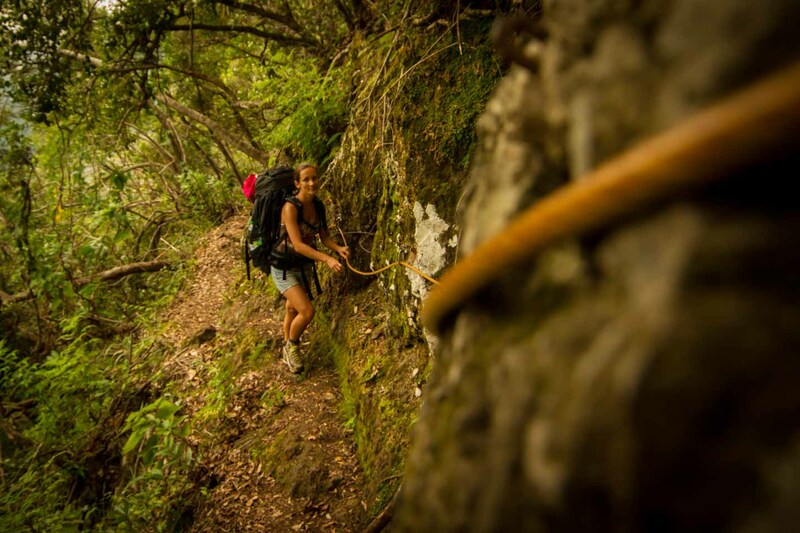 If you like hiking and spending the night in the nature, take it along. If you already have a crammed backpack and struggle leaving things behind, don't bother about taking a tent. If you are planning to buy a car you can sleep in, like we did in Australia, there is no need for a tent. If you still don't want to miss out on a few nights under canvas, buy a cheap one on-the-spot. If I had to decide again, based on what I know now, I would take our tent again. I love our tent, the nights we spent and the great flexibility we gained. Sure it adds some weight, but I rather sacrifice a few other things. I enjoy calling back the memories and in retrospective think we should have spent more time camping. If you now made up your mind and came to the conclusion to get yourself a tent, make sure to buy a decent one. Spent some time making a list of all your requirements, how many people and baggage you have to house, what temperature you are traveling in and what kind of environmental conditions you have to face. We used our MSR Hubba Hubba HP for over two years now, we absolutely love it and do not regret the investment nor carrying it half way around the world!